The Discsox HiDef Pro 24 dividers are designed for DiscSox HiDef Pro, Game Pro PS3 sleeves, Blu-ray and HD DVD keep cases. 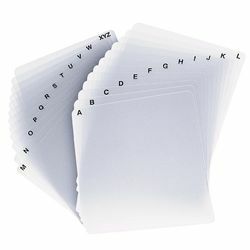 Made of environmentally friendly matte polypropylene, they can be customized with self-adhesive preprinted music, movie or number labels. Use the dividers to organize large collections alphabetically within a category. 6 3/16" x 6 3/4"